This entry was posted on July 13, 2009 at 1:41 pm	and is filed under Cranial Technologies, doc band, eastern cranial affiliates, Maysa, Orthomerica, post DOC band. Tagged: 531, brachycephaly, Cranial Technologies, ct, doc band, Laura Plank, Orthomerica, passive helmet, Virginia, Yahoo Plagio Group. You can follow any responses to this entry through the RSS 2.0 feed. You can leave a response, or trackback from your own site. I love the pictures, and thanks for sharing your story! My son was just started in a Starband. He is 5 months old. I love how you have decorated Maysa’s helmet. Can you give me any advice on how to do this? I have tried stickers, but they don’t seem to stay on well. I would appeciate any name brand if you remember them! My best to you and your family. Maysa is a beautiful little girl, and your story gives me hope for the future for my little guy! Thank you so much for creating this site! I’ve come back to it many times in the last couple of weeks. My family and I are stationed in Germany and my 9 month old daughter is scheduled to be fitted for a cranio helmet with Dr. Blecher here. I was surprised that I needed to twist his arm a bit for him to agree to put her in a helmet. Her cephalic index is .93 but it’s fairly even with only 4mm of asymmetry. I have the same worry about Elena’s head shape as you have about Maysa’s. Elena’s head is definitely getting wider and no amount of repositioning has worked. After reading your site, I’m a bit worried that we’re using a passive helmet instead of an active band, but in Germany I think this is our only option. Have you ever heard of the cranio helmet? Do you have any advice you could share? I tend to think that it’s worth a shot even with a passive helmet because her head is just getting wider, making her eyes look close together. 😦 I hope she doesn’t hate me for not dealing with this sooner — her pediatrician kept telling me it would even out. Thanks again, so much, for writing this! I am glad that you are finding this blog useful. We’ve got to find a way to spread the word and raise awareness about plagio/brachy, right? I think that at 9 months of age, and with a CI of 93%, banding is definitely worth it. I don’t know what’s the headshape of your daughter now and it might never look perfectly right to you but it will hopefully look normal to most people out there. Also, the band should help round out her head in the back which is the main issue with babies that have brachy. Repositioning is very hard in regards to brachy, so going the helmet route is probably you best option at this time. I did a quick search for the “Cranio Helmet” and it looks very similar to the DOC band. Are you sure that it is a passive band? 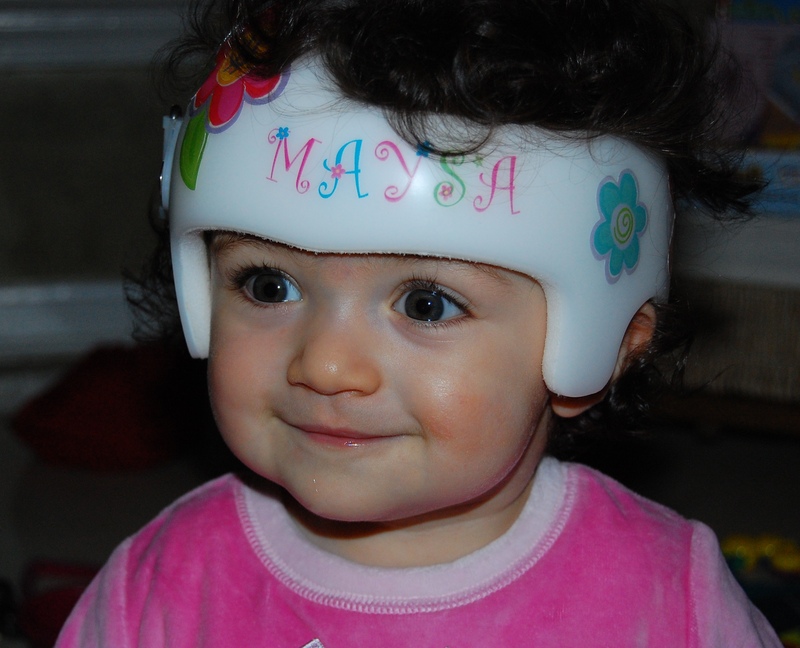 Maysa’s passive band was made of a clear material with no foam inside. Nothing was ever shaved off of it. The Cranio Helmet seems to have foam that can also be shaved off. If that’s right, then it should work more or less like the DOC band and it should also be an active band. Also, I recommend that you join the Yahoo Plagio Group. I just did another quick search for “Blecher” and several posts came up from other parents who’ve had to deal with him in Germany. The Yahoo Plagio Group has been the greatest support for me and I think it’s a great resource. Right before she actually gets her helmet, try to take pictures of her the way Cranial Technologies does. There were really hard for me to take but I am so glad I did because sometimes you forget how bad it was/looked at first until you are able to compare them to pictures that show progress. Do it periodically, at least every two weeks and the top, profile and front pictures are the best. How can your daughter ever hate you? You did and are doing what you think is best for her. I personally think that a good number of peds need to be better informed themselves on plagio and brachy and that it should be mentioned at the hospital, after birth, to every parent… How I wish I was someone a little more affluent right now! Finally, I would love it if you kept me posted on Elena’s progress in her band. I know she’ll do great, yet never refrain from being her best advocate. Your son should see wonderful results in his STARband. He is only 5 months old and the band is good for 6 months, so plenty of time to catch some good growth spurts. I never had to gutts to paint Maysa’s band, so I only used stickers and sometimes rub-ons for her name in the front. Some stickers lasted up to three weeks, others were off by morning time! The brand name of the ones I liked the most was I think “sticko” or “stickos”. I bought them at Michaels. I know that some people use modge podge on their stickers but I never had. I actually liked changing them every two weeks or so. I hope you see great results fast.